Esteban and I have been away for the weekend in glorious, exotic, and extremely windy (seriously 40-50 mph winds yesterday scary) Amarillo, Texas. We are here to celebrate the wedding of our friends Greg and Kay. Esteban was in the wedding and looked fantastic in his tux with a red vest and tie. The wedding held in the town of Groom, Texas. 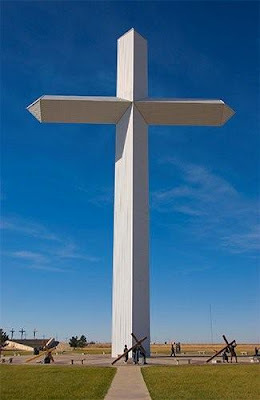 Which if you didn't know is home to the second largest cross in the Western Hemisphere (see below). The wedding was beautiful and the pastor was very charismatic and funny which was perfect for the fun loving couple. I did take some pictures in the wedding but I didn't have my memory card in my camera at the time. 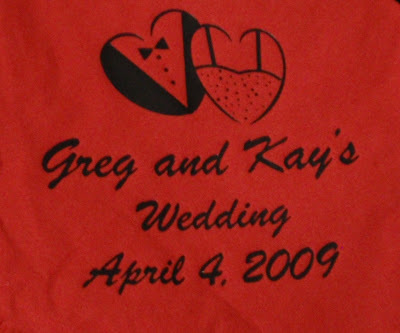 Hence you are only getting a glimpse at a napkin from the wedding which I just took a picture of to prove we were there. Good news is that I found out that my camera will save pictures on it. Bad news is I can't figure out how to get them off of there yet. :-) My camera is not smarter than I am, my camera is not smarter than I am . . Yep still on there. I had to take pictures at the wedding as there were so many jokes prior to the wedding about the height of the groomsmen. The groom is 6 foot 3 inches, his brother is 6 foot 5 inches, another groomsman is 6 feet tall, and then Esteban is 5 feet 7 inches tall. Esteban kept saying he wanted a little step to stand on during the wedding so he did not look too short. However, the day before the wedding we found out that there would be steps for the groomsmen to stand on but Esteban was on the ground level. Hence all the joking. I told Esteban if he was wearing a green vest he would have looked like a little leprechaun compared to the other groomsmen (not very supportive am I?). Anyway he looked fantastic and when I figure out how to get the pics off my camera I will attach them. It was a wonderful wedding and a great reception and I wish the bride and groom all the happiness in the world!